Installing aspectLED Flexible Strip Lights is easy! To get started, the only items you'll need are your aspectLED strip lights, a power supply, and some wire nuts or crimp connectors. Wiring your lights is as easy as making a few simple connections. Start by connecting the red (+) wire and black (-) wires from your LED strip light to the red and black wires on the output side of your power supply. You can make this connection using wire nuts, crimp connectors, or any other approved wire connector. Once you've connected your low voltage wiring, simply connect your power supply to 120vac. Most aspectLED power supplies come with a standard 3-prong plug, so you can plug it directly into an outlet. We offer a wide variety of power supplies, including many that are dimmable using a standard 120vac wall dimmer. Cutting your LED strip lights to length. It's quick easy to trim your LED strips to the exact length that you need. 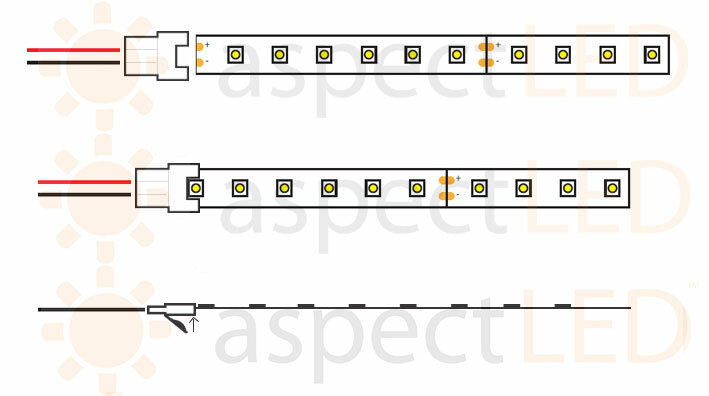 Don't worry, the UL listing on your strip lights is still valid, even after you cut them to length, as long as you cut on a designated cut mark. Using quick connectors to attach multiple pieces. Our LED strip lights come with wire leads pre-attached to both ends, so you can easily cut a strip in half to get two pieces, with each piece having wire leads. However, if you want to connect two pieces together, round a 90 degree bend, or bridge multiple strips (i.e. connecting between cabinets), you can easily do this with our strip light connectors. When using connectors, we recommend leaving the adhesive strip backing on the end going into the connector to make it hold as best as possible. Special considerations for wet/submersible locations. Remember that only our non-waterproof and water-resistant LED strip lights have 3M adhesive tape backing. The waterproof/submersible strip lights need to be attached using mounting straps or an adhesive caulk. The waterproof strip lights can also be cut and spliced/soldered, but it is important to carefully remove the protective silicone coating and to re-waterproof using silicone end caps and silicone after making your cut. See the detailed instructions on the product page for more information. Which strip lights should I choose? Do the strip lights include a power supply? No. Because each customer has a different length of strip light that they plan to use, and the size of the power supply will depend on the length of your application, every customer will need a different size power supply, so we sell these separately. You can see sizing instructions below. How do I calculate the size of power supply that I need? For optimum performance it is recommended that you do not exceed 80% of the labeled rating of your power supply. You can calculate the correct power supply size by multiplying the watts per foot of your LED strip lights (you can find this on the spec sheet for your particular product) by the number of feet of LED strip. This will give you the actual consumption. Then, multiply this number by 1.2 (to add 20%, so that we don’t exceed 80% loading on the power supply). As an example, if your LED strip consumed 2.93 watts per foot and you planned to use a full reel (16.4 feet), we would multiple 16.4 times 2.93, which gives us 48.05 watts. To add 20%, we then multiple 48.05 times 1.2, which gives us 57.66 watts. We then round up to the nearest size power supply, which in this case is a 60W led power supply. We have a convenient power supply size calculator near the middle of the page on each strip light product page. You can simply enter the total length of strip light that you plan to use and the calculator will do the math for you!